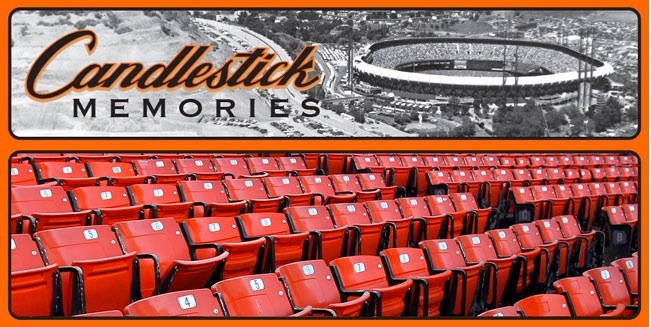 Candlestick Park Seats for Sale! Seats are sold in pairs or singles. Your choice of either Orange or Red. Removed by us, shipped direct to you! Limited supply! Buy now...once they are gone, they are gone! For immediate purchase, choose your color option above and click on the 'Buy Now' button. You will be taken to a secure PayPal site to process your transaction. Shipping to the Continental US (lower 48) is included in the price above. *For shipping to HI, AK and international, please contact us for addtional shipping charges. 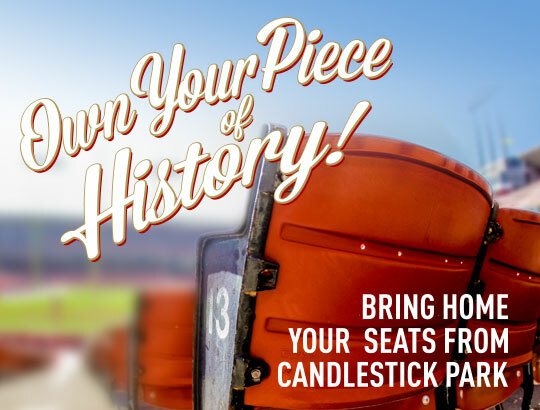 Own a piece of history from CANDLESTICK PARK! All of our collectible memorabilia is guaranteed authentic game used, as they were removed from the original stadium by our company. 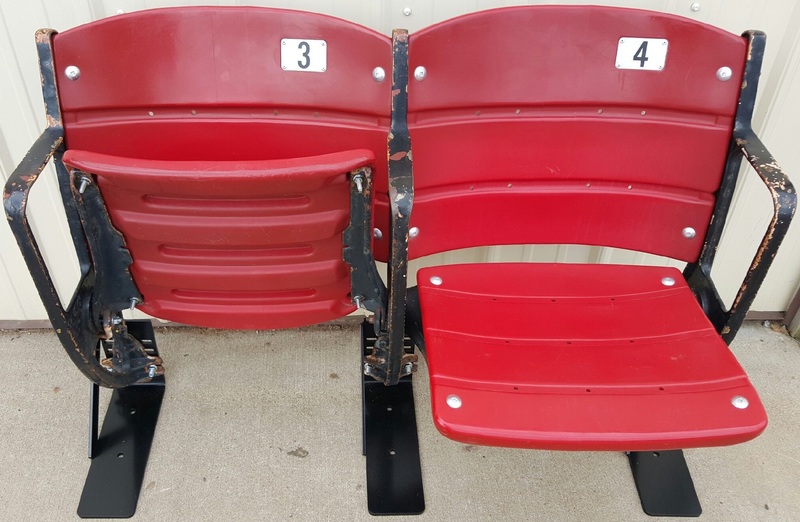 These seats were carefully removed from Candlestick Park in 2014 by S&S Seating under contract with the City of San Francisco, MLB's Giants & NFL's 49ers and have been warehoused for protection until shipped. We are NOT accomodating specific number requests. Seat numbers will be shipped at random. Numbers will be consecutive. We can not send pictures of the exact seats you will receive. Aisle seats are NOT available at this time. Your seats will be shipped via FedEx Ground services within five (5) business days of your payment. Seat pairs are shipped partially disassembled. Measurements: The width of a pair of seats ranges from 40" - 43". The depth of the seats is approx. 16" with the seat up and 22" with the seat down. 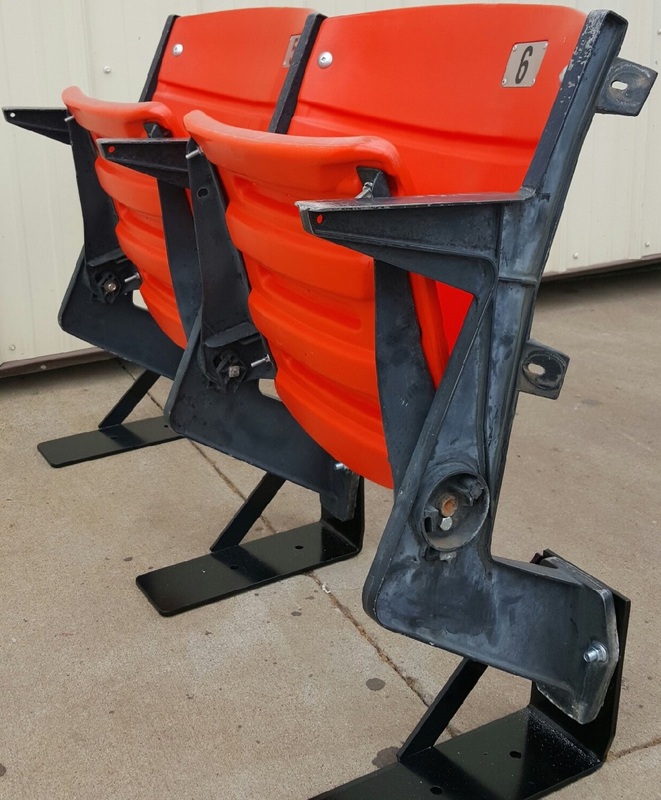 Seats are unrefurbished in the 'as-is' condition that we removed them from the stadium....the seat plastic will have color fade, scratches, minor cracks and markings from fan use and the metal standards (seat frames) will have scratches, paint rubbed off and rust. Please note our return policy prior to placing your order. The seats you buy will be similar to the pictures above, but will not be the exact seats. All seats are in working order. Riser-mount seats include steel brackets to enable the seats to be free-standing. 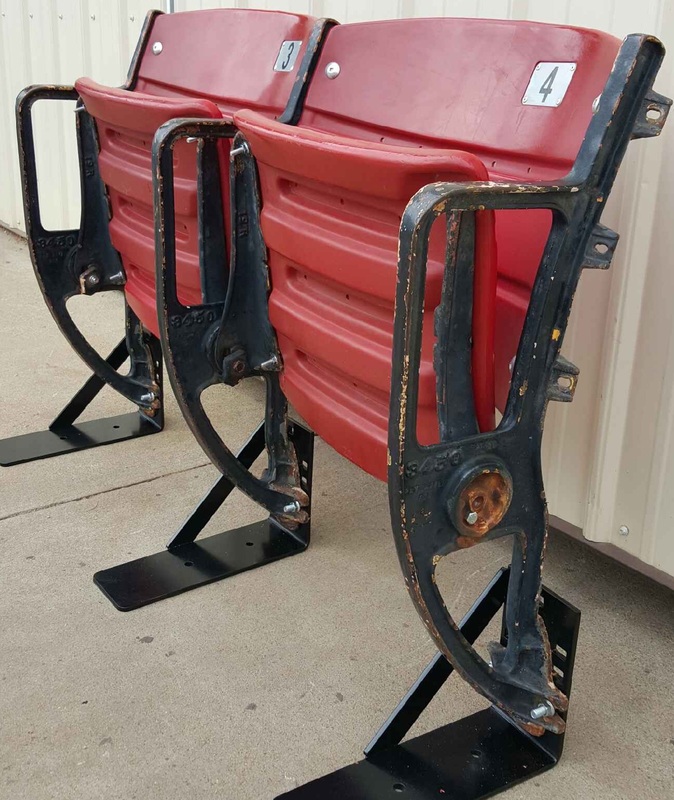 These stadium seats are sold solely for the purpose of being sports memorabilia. When the seats were bolted to concrete in the stadium which they came from, the seats were stable. But the seats are no longer bolted to concrete. Even after securely attaching the seats to the “L” shaped brackets that are provided to you, the seats could collapse or tip over, which could cause serious bodily injury, including, but not limited to, head, neck, and back injury. Do not sit in, stand on, or otherwise use the stadium seats, and keep children away from the seats until the “L” brackets are securely fastened to a suitable floor. 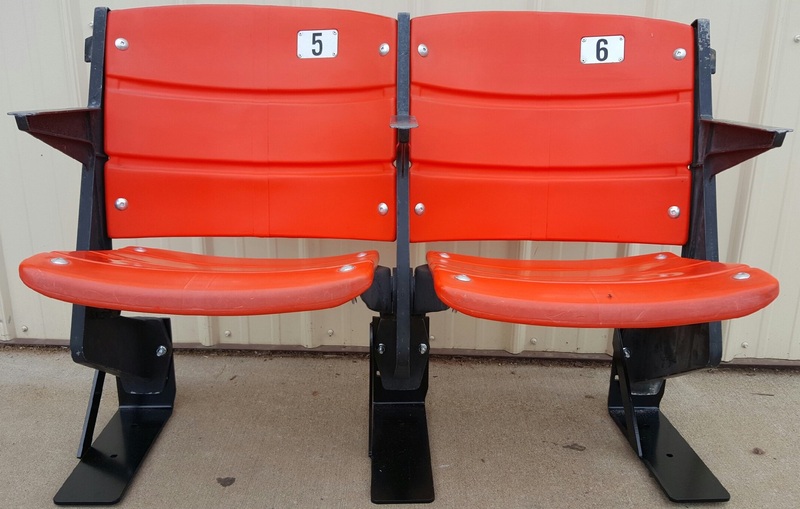 Once your stadium seats are securely fastened to the “L” brackets provided to you, call a qualified professional, one who works with the types of flooring you have in mind for your seats, to install the “L” brackets to your flooring. Flooring varies and only a professional will know where and how the “L” brackets may be fastened to your floor without destroying or harming your floor and how to ensure that the “L” brackets are securely and safely fastened to your floor. FAILURE TO APPROPRIATELY ATTACH THE “L” BRACKETS TO A FLOOR MAY RESULT IN THE SEATS COLLAPSING OR TIPPING OVER, WHICH COULD CAUSE SERIOUS BODILY INJURY, INCLUDING, BUT NOT LIMITED TO, HEAD, NECK, AND BACK INJURY.